I had a post that talk about to Try Chinese VPN To Watch England Premier League Online, that called Feiyi VPN but it seems so hard to use for people who do not understand Chinese, because it is a Chinese version with many steps. If you did wrong one step you could not connect to servers. Today, I would like introduce another Chinese software. 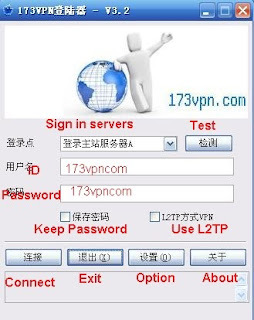 173VPN is another Chinese VPN search software, it can search some free VPN servers and helps you automatically sign in without ID and password. This software is similar with Feiyi VPN, but a little bit easier to use than Feiyi VPN. It is a freetware but service is commercial. Fortunately, it opens All Chinese servers (18 servers now) for free, you only have to pay to use oversea servers. For me, I only use Chinese VPN servers so I do not have to pay any penny. Look at these screenshots below, you see it is not too difficult to use. OK, let me tell you how to do. Direct download software from official server click here. Download application from box.net click here, this is a clean one, I took out some junk files. First, open 173VPN, this is main interface of application. Fill ID and password, they are same one: 173vpncom. Tick "Keep Password" for next time when you sign in you do not have to fill ID and password. Choose application server A/B (anyone), Click "Connect" button. After you sign in application it appears this window, choose a server from 01 to 18 (anyone). Click "Enter Server" button, after that a small icon will stay system tray. That is all you can do, you can watch video in any Chinese website. Remember: Application ID and password are same one: 173vpncom (it can be changed anytime). I had try this software to watch live game about one hour, no any problem, speed is very fast.